Charts are a great visual aid when presenting data. You can't build a professional admin panel without them. They are also tricky to set up. However, there is a new library that makes things easier - xCharts. 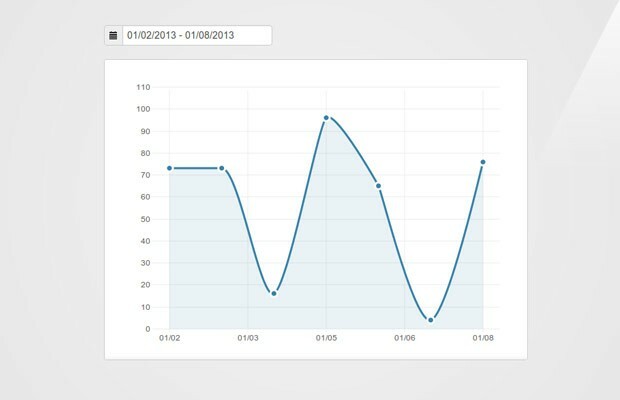 Today, we are going to use it along with the daterange picker for Twitter Bootstrap, to build a pretty, AJAX-powered chart for your web application that fetches data from a MySQL table. The HTML structure of the demo is pretty simple - we have to add elements on the page for the initialization of the chart, and for the date picker. As we are including bootstrap in the page anyway, we can make use of its form styling abilities and icons to make it look good. We are including a good deal of external resources here. In the head section, we have the css files for xcharts, the datepicker, bootstrap (included from cloudflare's super fast cdn), and our style.css file. Before the closing body tag, we have the jQuery library, d3.js (required by xcharts), xcharts, the elegant sugar.js library (required by the date range plugin), the date range plugin and our script.js. In the next steps you will see how all of these work together. It has only three fields. The date field is assigned a unique index, which means that there cannot be duplicate records for the same day. The sales_ord field holds the number of sales for the day. Your database will surely differ, but as long as you return the correct JSON response from your PHP script, there won't be any problems (more on that in the next section). Note: Remember to enter your MySQL connection details in setup.php. You will then have to create a new MySQL database, and import schema.sql from phpMyAdmin or your management system of choice. Here I am using a favorite library of mine - Idiorm. I have used it before in tutorials in the site (and in many personal projects). It is only one file (located in the lib/ folder) and makes working with databases a pure joy. All I am doing is selecting all the results from the database, which have a date value between the start and end timestamps passed with the request. All of our JS code lies in assets/js/script.js. The code is a bit long, and to make it easier to follow I will present it to you in chunks. 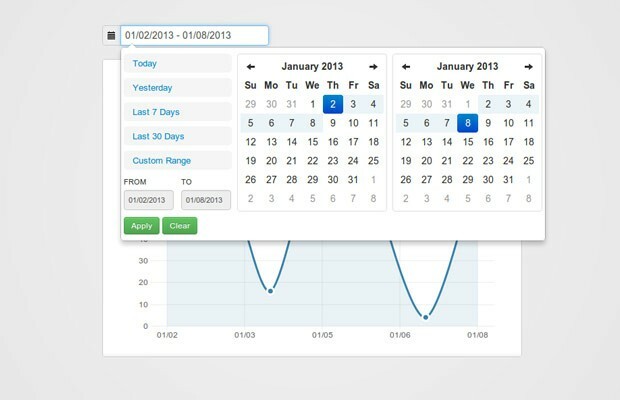 First we will declare a few variables and initialize the date range picker plugin. Notice that the date range I linked to is a fork of the original plugin. I decided to go with this version, as the original depends on date.js - a very old date/time library that conflicts with xCharts. The fork instead uses sugar.js which is a nice utility library with powerful date and time support. As you can see, we are making good use of sugar.js' date and time methods to define the start and end point of the range. I am initializing the script with the results from the last 7 days, and updating the range input field. // Provide formatting for the x-axis tick labels. // This uses sugar's format method of the date object. I am also passing an event handler for the mouseover/mouseout plugin events, and use them to show a tooltip (the plugin doesn't come with one out of the box). xCharts exposes the setData method so you can easily replace the displayed data. The className attribute is important, as this is what the plugin uses to identify your chart. If you omit this property, all kinds of strange bugs will occur (trust me, I know). With this our pretty charts are complete! You can use this example to enhance your admin areas and to visualize statistical data in a beautiful interface. Sometimes more than the application itself, I love how you have introduced me to a lot of useful server/client side libraries (heck, I even migrated my blog to Linode thanks to a recommendations from this site, and I couldn't be happier). In this case I didn't know Idiorm, which seems perfect for applications that need a DB but not a full stack framework. Sure I could assemble several composer libraries to build it but that might be "a little" too much. greate!!! but i have problem witch change connection style. Or could you explain how to use Idiorm public function sum? You should escape the $start and $end variables before including them in your query, as now your code is open to SQL injection attacks. I would advise you to use pdo or a library like idiorm that will sanitize your variables automatically. I am not sure what you want to do with your query. Do you want to show a sum of all the sales for the period? If you want to only convert the code from Idiorm to mysql_ functions, you don't need the sum() part - sales_order already holds the sum of the sales for the day. i have database witch date field is not assigned a unique index. now i try to sum() 'salesorder' and GROUP BY date. "..as long as you return the correct JSON response from your PHP script, there won’t be any problems"
Is there way to make this chart into a Wordpress plugin If so please let me know it. Exactly what I needed thanks! Wow! I can't wait to implement this somewhere. I'd really like the visuals of it. GREAT WORK! excellent tutorial! Does x-charts support multiple dotted-lines on the same chart? Great tutorial. I was wondering if the download came with the random data as well? I am wondering about this the other day, thanks for saving me some time! You always provide useful tutorials. I'm wondering how to make the d.y show decimals, right now it seems to be round it up. do I need to change something in xcharts.min.js, where to look? Great tutorial and very nice looking. HI, I have a question. How can I draw a label to show the number on each bar? Hi Kentoro ... Thanks a lot. Excellent tutorial which I've successfully implemented with Python+Django. One question, though: How would I place objects (bullets, etc.) at specific points within the chart, as seen here: http://screencloud.net/v/sPAv ? If it's not too much to ask, I would like to know if this can easily be dragged, eg drag from one year to the other without the daterangepicker. I need two different chart is same page. Is it possible? I need two different chart in same page. Is it possible? Hi, thanks for a great tutorial! I however just noticed that the custom range calendars shows the wrong weekday, today (2013-04-23, tuesday ) for example, it shows Friday. This occurs on the demo aswell as my own implementation of the daterange picker. Any advice how to recitfy this? is it possible to get the data if we have one more column in table and get the data for specific value of that data... say sale of some particular item. i made the changes in scripts.js and ajex.php but i am not getting where to change for the rest. As above change i am getting the data on load but not able to get the data if i change the date range. i am getting the input for the item using GET. Is there a way to use this chart with cakephp? I am confused about combining idiorm with cakephp default query structure. I haven't used CakePHP, but the best way would probably be to convert the code from Idiorm to that of CakePHP's built in database querying functionality (be it an ORM or another kind of abstraction). Thank you for your tutorials, How I can show legend on xcharts ? Nice tutorial, I dont see any legend implementation atm but it might be on the table (as suggested here: https://github.com/tenXer/xcharts/issues/30). I guess you have to show it outside the graph with the same css colors as the lines (as I had to do for a project). The option that I'm missing is I need to invert the values on the Y-axis so they start from 1 at the top and inscrease toward the bottom. Couldn't get it to work but I'm already deep into using this plugin so I can't switch easily so I had to leave it for now with minus values rolleyes. Will it work on IE 7 & 8? how to display x- and y-axes label in xcharts? Currently I'm trying to debug it, with no luck yet. If you have some spare time, would you be so kind to have a look at it? Mr. Martin Angelov, This is a nice plugin for my website. However, I need to ask you a clarification.